Patrick Stewart backs assisted dying Jump to media player Actor Sir Patrick Stewart has joined campaigners on a march in support of assisted dying, as the House of Lords debate a new attempt to change the law. 'In their eyes, my life's not worth living' Jump to media player Baroness Grey-Thompson says Lord Falconer's Assisted Dying Bill is a "chilling prospect for disabled people". 'I'm too nosy to want to die' Jump to media player The Assisted Dying Bill is due to receive a second reading in the House of Lords on Friday and for some people it is not a simple argument about choice. Assisted dying bill 'scares me' Jump to media player Lord Falconer and Baroness Campbell discuss a bill on assisted dying to be debated in the House of Lords. Lord Carey backs assisted dying Jump to media player Ex-Archbishop of Canterbury Lord Carey says he will back a bid to make it legal for terminally ill people in England and Wales to get help to end their lives. 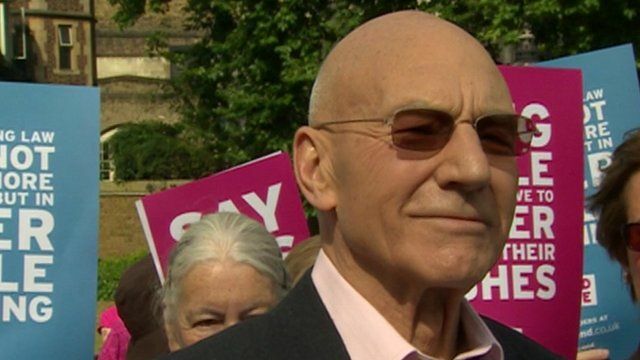 Actor Sir Patrick Stewart has joined campaigners on a march in support of assisted dying, as the House of Lords debate a new attempt to change the law. He told the BBC that the death of his friend's partner drove him to join the campaign and he believes the law will change.